The Minster is built on, or immediately adjacent to, the site of a Roman building complex. The tympanum in the north transept is of Saxon-Norman date and may have come from the pre-Conquest church on this site, as have four baluster shafts now preserved in the nearby Minster Centre. 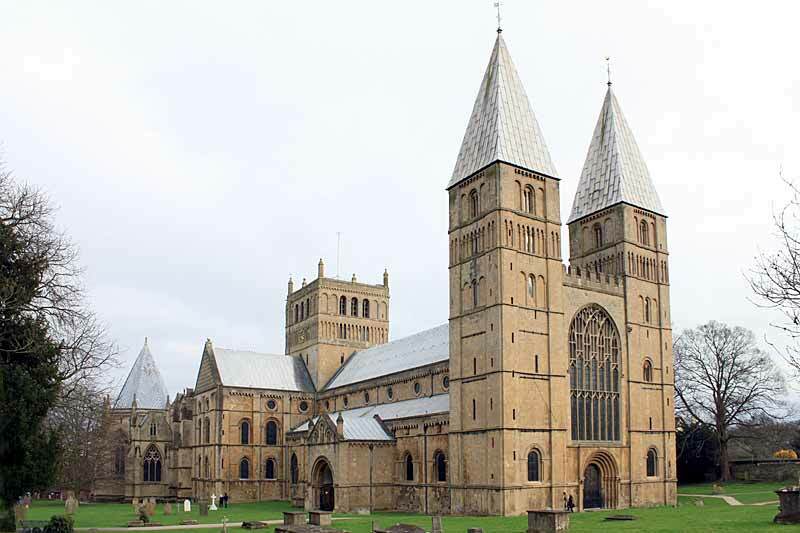 Work began on the Norman nave in 1108, using stone from Mansfield quarries. The church is a cruciform structure with nave, transepts, screen, choir, sanctuary, three side chapels, chapter house, north porch, twin west towers and a central tower containing 13 bells. The nave has seven bays with the pattern of columns and arches repeated at the triforium and again at the clerestory. Important historiated capitals of the early 12th century, depicting the Last Supper and other key scenes, decorate the east crossing piers. The composition of the 12th century transepts is strong and simple with blank arcading the whole height of the ground floor. The north porch is Norman, zigzag-decorated and tunnel vaulted (very rare in England); it has a room with a fireplace above. In 1234 The Archbishop of York decided to pull down the Norman east end and replace it with a larger and longer Early English choir. The pattern is identical to that at Beverley and Salisbury. In c1288 work began on the Chapter House. The entrance is via a marvellous pointed arch decorated with superlative carved leaves. Inside the octagonal structure, unsupported by a central column, contains no Christian symbolism but delightful carvings of leaves, animals, birds and Green Men. The form of the Chapter House bears similarities with those at Wells and Elgin cathedrals. The stone screen was added in c1320-40, replacing one of c1250 and restored in 1820 by the Bernasconi brothers. There are masses of small heads full of caricature, jokes, lust and laughter. The sedilia must be by the same masons, who might have been directed by the Master Mason Ivo de Raghton. The brass lectern dates from 1503 and the font from 1661. The pulpit is by G F Bodley. The timber barrel-vaulted roof of the nave and the pinnacles of the west towers were designed by Ewan Christian in 1879-81 and replicate those destroyed by fire in 1711. There is good Victorian glass by O’Connor and Kempe. The glass in the great west window was designed by Patrick Reyntiens and installed in 1996. There is good wood carving ranging from medieval misericords to Thompson’s mice. A fine alabaster memorial to the Archbishop of York, Edwyn Sandys, is matched by a bronze bust of Sir Edwyn Hoskins, 2nd Bishop of Southwell, and a large bronze figure of George Ridding, the first Bishop. 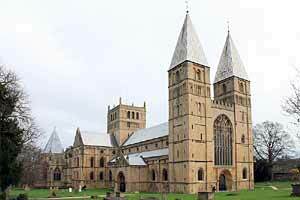 The Minster became the cathedral for the new Diocese of Southwell in 1884.